On Monday 13 February 2017 OPAWC participated for the second time in One Billion Rising (OBR) of Women in Afghanistan. This day is celebrated in most countries of the world to end violence and injustice against women. Billions women and men are participating in this rise to stop violence against women, to decrease different types of injustice and cruelty against women and foster solidarity among them. Women should not be like a symbol in society, they must have the chance to achieve their goals and fulfil their hopes, reach their aims for which they are struggling in their lives, and to find their own place and equal rights in the society. As usual OPAWC always raises its voice against any case of violence against women and supports them to defend their right. This year OPAWC staff and students also participated in a gathering on the occasion of OBR. 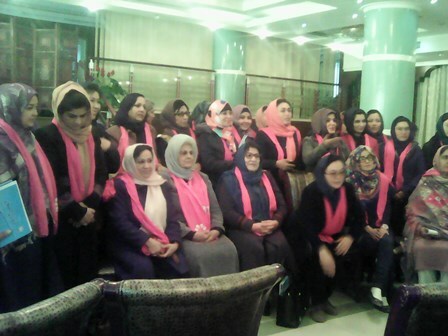 The gathering was arranged by Afghan Women's Network (AWN) with cooperation of its members, one of them being OPAWC, the organisation that is always working hard to provide a comfortable environment and safeguard the rights for the people, especially the women. In the current year several shocking cases have happened, among which we can just mention Zahra a 14 year old girl in Ghore Province, who has been burned by her husband and mother in-law and died with a baby in her belly. Another woman was put on fire in Kabul by her in-laws and died in the hospital. Yet another woman was first beaten by her husband in Takhar province, who then shaved her hair. These are just a few examples; we are aware of such incidences every day in every corner of the country. OPAWC strongly urges the government and related institutions to be serious about the issue and stop all cases of violence against women in the country.